And Now For Something Unusual: Another Blind Beagle! Okay, so she's not as exotic as a blind Shepherd from Afghanistan, but at least she isn't another blind Beagle from Georgia! No, she's a blind Beagle from Washington state. This is Carmel from Gig Harbor, and with her are Shirley L. and James C. from Portland, Oregon, wonderful supporters of the ranch who kindly drove Carmel out to us yesterday. Carmel's owner was going through some difficult times and could no longer afford to provide for her or get her the medical care she needed for her eyes. Carmel's vet talked with a veterinary ophthalmologist in Olympia, Washington, who recommended they contact us about placing Carmel at the sanctuary. So after talking with the owner and the vet, we agreed to take Carmel. Typically we don't take dogs and cats from private individuals, because we try to reserve our very limited space for when shelters and rescue groups call us about a disabled animal who has no other options. Usually that's the last call they're going to make for the animal. We have made exceptions, though, in cases where we're convinced the owner has already tried everything possible and where medical care is clearly needed. When we saw the first photos that Carmel's owner emailed us, we winced looking at those solid gray eyes. Shirley and James picked up Carmel on Monday and kept her at their house for us until they could get to the ranch. 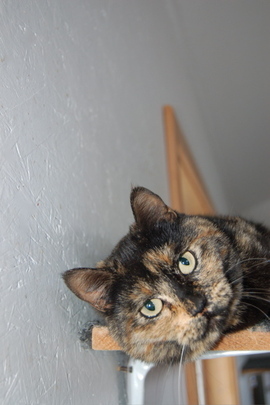 After Carmel arrived at their home, Shirley emailed to say, "She is one SWEET girl!!!!" Carmel sees Brenda early next week, and meanwhile, she is on pain medication for her eyes. Like all of these incredibly stoic animals, the discomfort she must feel certainly doesn't affect her disposition. She has settled right into the routine here, making herself at home in our house and exploring the yard. Poor Briggs was so excited (again) to see a new girl arrive at the ranch, but alas -- like all the others before her -- Carmel has kept her distance from the teeter-tottering, overly eager Beagle from Georgia. Barbara Edwards, the quiltmaker who each year makes a beautiful quilt to raffle off for the sanctuary, called to say that our blog readers had already bought all the raffle tickets she had planned to sell for this year's quilt! She was just amazed at the response she's received in the mail so far. Because we know that some checks are still on the way to her or about to be mailed, Barbara will expand the raffle ticket allotment to accommodate everyone. So Barbara will allocate raffle tickets to all the folks who have sent in their checks or whose envelopes are postmarked no later than this Saturday, May 31st. It's clear that there will definitely be far more than $1,000 from this raffle for the animals -- and that is a real blessing! Thank you! All The Way From Afghanistan -- Here's Shep! Yes, you read that right. Afghanistan. We were contacted back in March by the Afghan Stray Animal League, a U.S.-based non-profit organization that works to help homeless animals in Kabul, Afghanistan, by supporting a small shelter there. The shelter had taken in a blind Shepherd puppy, an animal that stood no chance of adoption. They had named him Shep. Afghan culture doesn't have much of a concept of "pets" or companion animals -- not unexpected in a country with such grinding poverty and bloodshed -- so the shelter mostly adopts animals to foreigners living in Afghanistan. Other cultural norms make Afghanistan a rough place to be an animal ... especially a weak or disabled one. It took a couple of months to work out the travel logistics, but late last week Shep flew from Kabul to Islamabad, Pakistan, and on to JFK Airport in New York. The Afghan Stray Animal League was able to raise about half the money needed for his airfare, and we paid the rest. 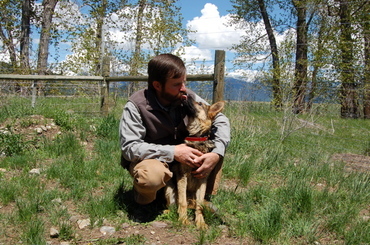 After spending the weekend at a veterinary boarding facility at JFK, we flew Shep out to Montana yesterday. He arrived in Helena last night at 11 p.m. on a Northwest Airlines flight. 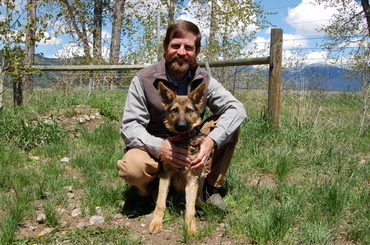 After a potty break outside the Helena airport, I loaded his crate in the bed of the truck and put Shep in the big back seat. He sat there quietly for the entire drive back to the ranch, and we got home about 1 a.m. this morning. He's a tiny thing for a Shepherd, weighing about 30 pounds. I think half his weight is just in those ears! His eyes are clear, so I suspect he has progressive retinal atrophy or a similar retinal deficiency. We'll be taking him next week to see our vet, Dr. Brenda Culver at Montana Veterinary Specialists in Helena, for a comprehensive eye exam. So, How's That Other Eye? 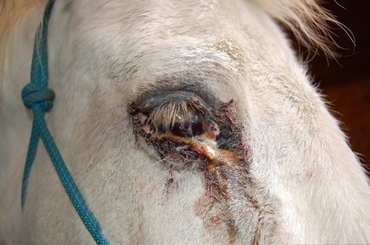 You may recall that when our mare Lilah poked her right eye out last week, we had noticed some changes in her left eye but weren't sure what they were. 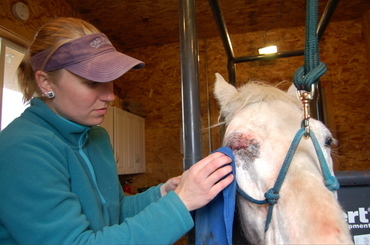 Our equine vet Dr. Erin Taylor -- who was attending an equine ophthalmology course last week in Florida when Lilah injured herself -- came out today to examine that other eye. That's vet tech Julia holding Lilah while Erin uses her new slit lamp on Lilah. Erin noticed two things. First, Lilah has nuclear sclerosis, the cloudiness that occurs in the lens nucleus as a normal part of the aging process. We see this in old dogs a lot, too, and it doesn't affect vision. The other thing that Lilah has are vitreal floaters, in which some of the vitreous fluid in the eye begins condensing into particles that float around in the remaining fluid. 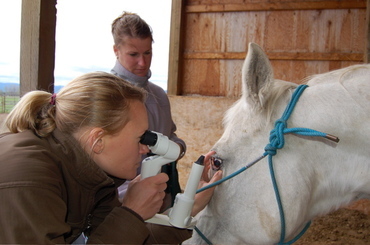 This can also be an age-related change, though in some cases floaters develop as a result of equine recurrent uveitis. Lilah has congenital stationary night blindness but not uveitis, so most likely her vitreal floaters are an aging issue. They are generally considered to be benign. 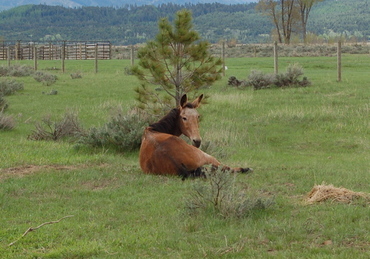 I thought you'd like to know that our beloved old mule, Roy, is doing much better after losing his buddy, blind Scout. We have continued to let him wander the ranch at will, which suits him just fine. People who have come to the ranch in the past week are often startled to see this big-eared guy walking around freely. 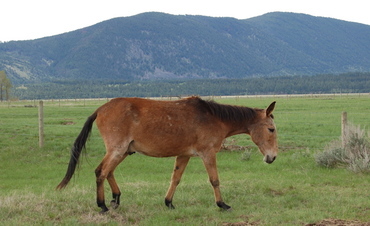 They turn to us and ask, "Say, do you know you have a mule loose?" Roy has started attaching himself to us, and whenever we're around Beauty's Barn, he quietly ambles over and walks up to us until his massive head is just an inch or so from our chest. That's the signal for, "Go ahead. Scratch me." There's nothing he likes more than to have those ears scratched, which is what I'm doing in the photo at the top that Alayne took this morning. So his routine now is to hang out inside the south end of Beauty's Barn, in the barn aisle right outside his and Scout's stalls, and use that as his base to explore. Roy visits blind Hannah and Luna in their corral, and he stands next to old Crazy Horse and little Brynn when we put them up in their stalls for the night. He's even taken to coming down to the welcome center in the evenings. Roy has visited the sighted horse herd again, though I suspect it's as much to rub their horsey noses in the fact that he, a mule, is free to wander and they are not. Hee-haw. He's the original smorgasbord-eater, preferring to sample a little of this and a little of that. 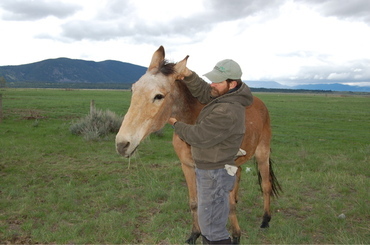 This preference for nibbling has always made it difficult to keep weight on the old guy, although our equine vet, Dr. Erin Taylor, says that for an ancient mule he's in good body condition -- despite some bony ribs. But his new set-up is perfect for his eating style. Roy's got a stack of alfalfa hay flakes at the north end of the barn, bales of grass hay at the south end, and green grass wherever he goes. Though true to his smorgasbord nature, he'll still eat the hay in addition to grazing the grass -- unlike other equines, who wouldn't touch the hay if they could have green grass. Our biggest nutritional challenge has always been to get him to eat his equine senior grain, which he just picks at in small bites before losing interest. Other equines would wolf it down, but not Roy: "I'll just have a sample, thank you." That's his style. But he'll gladly come over to get a mouthful or two when I dish it up for Crazy Horse. Just don't serve him a couple of scoops of the stuff. His major health problem continues to be his joints. After he arrived last summer, Erin X-rayed his legs and called him a "walking arthritic nightmare." Following joint injections, lots of farrier work, and daily anti-inflammatories, he is better than he was ... but there is only so much we can do for him. You can see in that photo above of Roy walking how he is dragging that left rear foot. He does that with both rear feet. Like blind Laddie, we continually assess Roy's quality of life and his physical comfort. The 3rd Annual Rolling Dog Ranch Quilt Raffle! 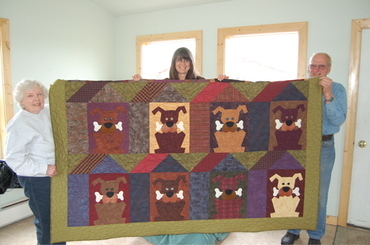 What you see in the photo is only half the quilt ... it was too big for us to hold up the entire thing! The dimensions are 86" x 103". 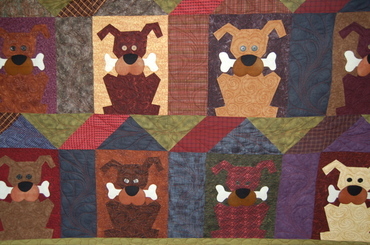 This year's quilt is called 'Bone Appetit' ... for good reason, as you can see. -- 200 tickets available for $5 each ... so $1,000 to benefit the animals! There you have it ... Bone Appetit! We never know how the day is going to go when we get up every morning, because we never know what we're going to find. That's what happens when you're caring for more than 80 animals. Today's 'morning surprise' was finding that our mare Lilah had punctured her right eye overnight. This wasn't your typical corneal ulcer, but a deep, penetrating wound that went all the way through the cornea and into her eye. The internal contents of her eye were leaking out and down her face. I couldn't imagine the pain. Lilah can see but has night blindness, so she's the spirited boss of the sighted horse herd during the day but a meek little thing at night. 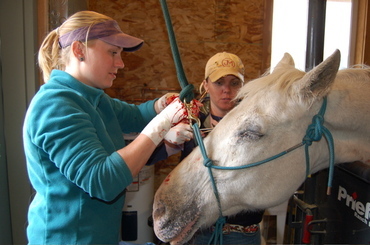 When this trauma happened she was in her corral, which has smooth Priefert panels for fencing, so we have no idea at this point how she did this. 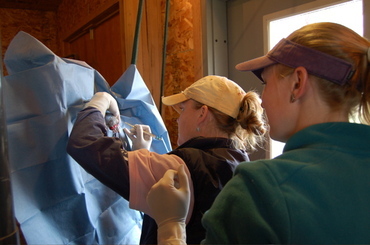 Ironically, our equine vet, Dr. Erin Taylor, has been in Florida this week attending a special equine ophthalmology program taught by Dr. Dennis Brooks, Professor of Ophthalmology at the University of Florida's College of Veterinary Medicine, and three other leading equine ophthalmologists. 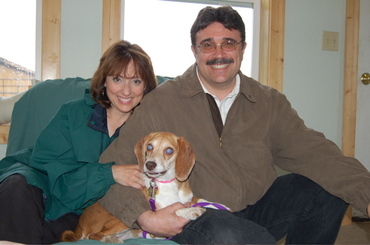 Thus I called Dr. Angela Langer, Erin's colleague at Blue Mountain Veterinary Hospital, when we discovered Lilah's injury. While we had Lilah sedated we noticed her left eye was undergoing changes, but what exactly was going on we weren't sure. When Erin returns, fresh from her ophthalmology training, she can tell us whether Lilah will be joining the ranks of the blind horse herd some day! I was taking photos for our summer print newsletter yesterday, and one of the animals who will be featured in this next issue is three-legged Honey Girl. She came to us last December from the Spokane County animal control shelter. She is a complete ham and a show-off, and she will do anything to get attention. Alayne calls her 'Pretzel' because of her ability to twist herself into all kinds of odd shapes. 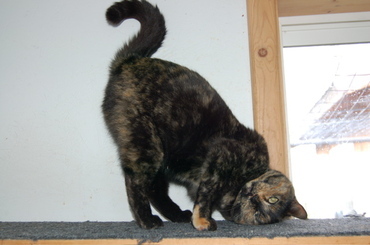 She is usually on the perching shelves that line the walls of the cat house, and as soon as we walk in, Honey Girl begins throwing herself upside down or rolling on her back or hanging off the shelf. In other words, anything to draw attention to herself. In that photo of her at the top, you see exactly the kind of thing she does. "Over here! Look at me!" In case the visuals aren't enough, she often chatters with little meows as she goes through her routine. So while Alayne calls her Pretzel, I call her Showgirl. Judging from the number of emails and blog comments we've had, it appears I have been rather delinquent in posting an update on the blind Poodle sisters! They are doing great, and have joined the other disabled dogs over at Widget's House, our main dog building. I took the photo above of Alayne with Priscilla (standing) and Molly this afternoon, on a very warm and windy spring day. Although many people think of Poodles as fancy city dogs, their real history is that of a working dog. 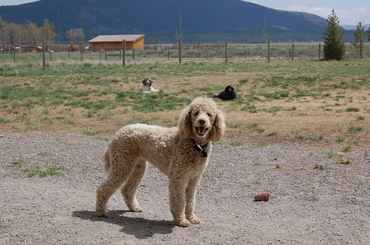 Here's what Wikipedia's entry says: "Poodles are retrievers, or gun dogs, and can still be seen in that role. The show clips evolved from working clips, which originally provided warmth to major joints when the dogs were immersed in cold water. The rest of the body is shaved for less drag in the water. 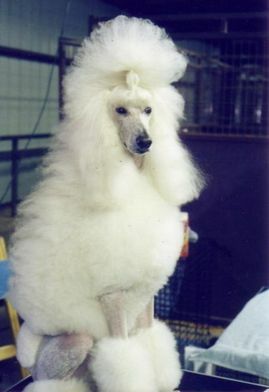 Poodles are skilled at most other dog events including agility, obedience, tracking, and even herding." Here's another photo I took this afternoon. That's Priscilla in front, with Molly lying in the grass behind her and wobbly Allie enjoying the sunshine, too. Both Molly and Priscilla really seem to enjoy having all that space to run around in ... there's a lot to sniff out there! 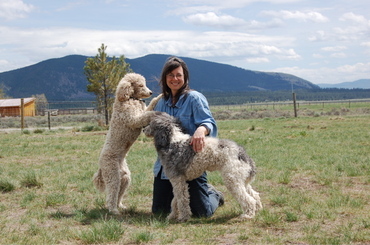 These girls are Montana ranch poodles, after all! Thank you to everyone who has posted or emailed us such wonderful sentiments about Roy and Scout. We really appreciate it! I wanted to let you know that Roy is doing better. Last night, about 8 p.m., Alayne and I looked out the living room window and were startled to see Roy had made his way down to the sighted horse corral. This is about 100 yards from Beauty's Barn, and thus the first sign -- and a very healthy one -- that he was starting to explore again. I got the camera and walked out to take the photo above of Roy greeting a couple of the sighted horses. The white horse is Lilah and Blueberry is behind her. 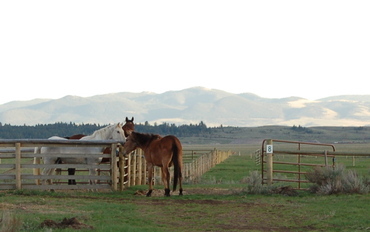 Since Roy arrived last summer, he had only been with Scout and the other blind horses who live at Beauty's Barn. So I think he was a bit surprised to notice that, holy smokes, there are some horses at the ranch who can actually see! We would never put Roy in with our small herd of sighted horses because they would, sad to say, chase him around and pick on him. And given his rickety and creaky old joints, that's the last thing he needs. I think that thought was crossing Roy's mind just about the time I took the photo, because the greeting lasted only a minute or two and then he wandered through that open gate and made his way back down to Beauty's Barn. This morning when I went out to feed, I found him standing in the barn aisle again, outside Scout's stall. But we were pleased to see him venture that far afield last night.